This recipe is quintessential Bengali fare. Roasting the Mung Dal gives this dal an earthy, nutty flavor, and makes this one of the dals, which in my opinion, can stand on it's own. While the recipe itself is easy to follow, you need a specialty five-spice mix called Panch-phoron, ubiquitous to Bengali cuisine. 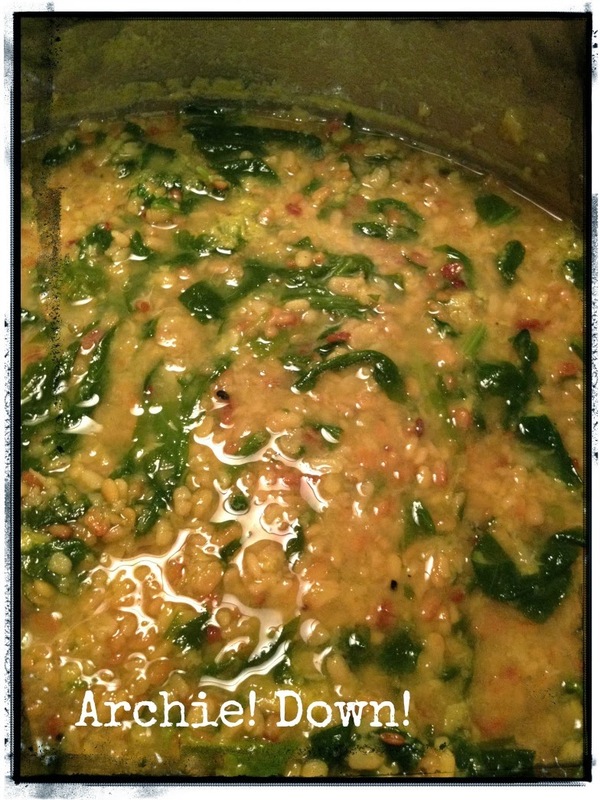 This dal used to be made with spinach in our family, but an over abundance of swiss rainbow chard had me experiment with the leafy vegetable, and to my delight, this dal is even better with swiss chard, than with spinach. Dal is an incredibly versatile meal. It is easy to cook, vegetarian, high in fiber, and offers some protein. The addition of swiss chard only adds to the nutritiousness. This dal, by the way, like many types of dal, freezes well, but should be used within 45 days of freezing. The dal after should look like this after roasting. Pick the dal over to remove blemishes, or small pebbles. Roast the mung dal on medium low heat until it has developed a lovely reddish color. Stir frequently and be vigilant, this stuff burns quickly and you'll need to start over. Once the dal has finished roasting, rinse once or twice to remove dust and impurities. Add water, the bayleaf, the turmeric powder, and red chiles, and bring to an easy simmer. When the dal is almost tender add the chopped leafy vegetable of your choice. Return to simmer. 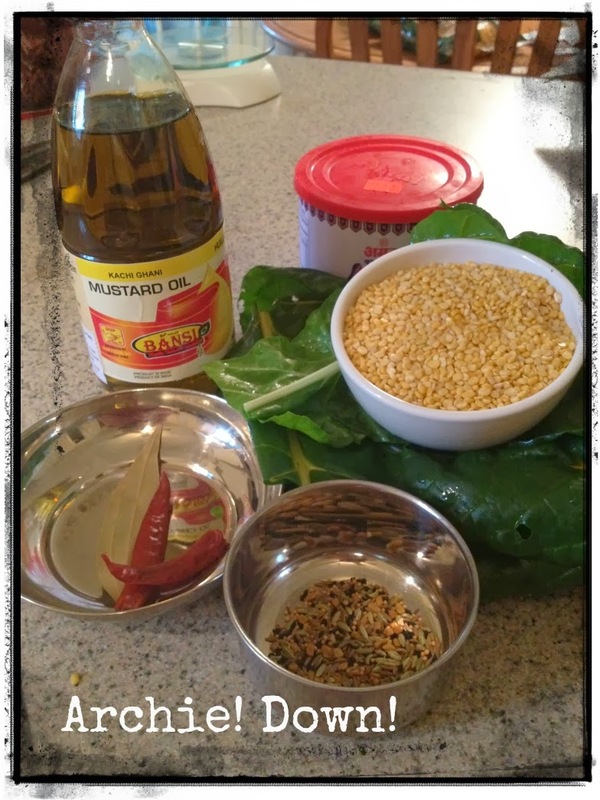 Heat the oil or ghee in a small pan and add the panch-phoron. 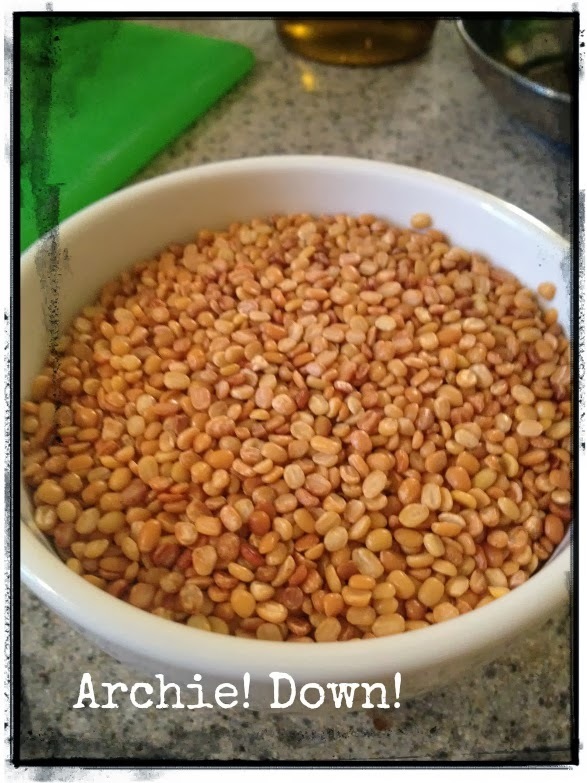 When the seeds have sputtered, add this to the dal along with salt to taste. Simmer until the vegetables and dal have cooked through and are tender. Serve over hot rice (GF), or better yet, with some chapati.